Phyllo (in Greek: φύλλο, pronounced FEE-lo), also spelled “filo,” is most often used to describe wafer-thin sheets of dough that are used to make some of the most delicious pastries and savory pies in the world. However, phyllo has gotten a reputation as being hard to use, or too delicate, with the result that many people stay away from it and use, instead, puff pastry or strudel doughs that just don’t give the best results. Baklava-type pastries are thought to have been created by the Assyrians around the 8th century B.C.E. 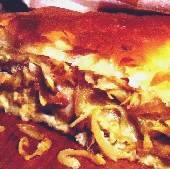 Originally made with layers of bread dough, the recipe traveled across borders, throughout the Balkans, to Greece, the countries of Asia Minor and the Middle East, and as far west as Ancient Persia. The great Greek contribution to these pastries and pies was the technique for creating the wafer-thin dough we know today as phyllo, sometime around the 3rd century B.C.E. Commercially packaged frozen phyllo is low fat or fat-free (check package information). The best phyllo is fresh phyllo (never been frozen), but frozen works very well. Look for a short shelf-life because even frozen phyllo can hang around too long. Phyllo sheets can be used even if they’re torn. They can be patched back together and because dishes using phyllo are made with buttered or oiled layers of the dough, patched holes or patched-together pieces are rarely, if ever, noticeable. Packaged phyllo comes in different shapes, like pastry cups, and in different forms, likekataifi dough, which is shredded phyllo. Packaged phyllo does dry out quickly (in just a couple of minutes) when exposed to air. Once opened to make a recipe, keeping it covered with a piece of waxed paper and a cool damp towel will keep it flexible. In many vegetable dishes using phyllo (like spinach pies), butter is not used. The phyllo sheets are brushed with oil. While many chefs say that only the best butter should be used when making sweet phyllo pastries, home cooks say that butter-flavored cooking spray (or a combination of a little butter and the spray) works just as well, and many traditional recipes for Greek sweets call for olive oil rather than butter. Never handle phyllo with wet hands. Bake phyllo pies and pastries at approximately 350°F (175°C) on the rack just below the middle of the oven. Defrost properly following package and/or recipe directions. While working, keep unused phyllo covered to prevent drying. Don’t throw out damaged, torn, or unused phyllo! When making a recipe that calls for 1 package (1 pound) of phyllo, always buy two, just in case. When using frozen phyllo, thaw completely in the refrigerator for 24 hours and bring to room temperature before using or the dough can be gummy (if thawed too quickly outside the refrigerator) or crack (if still partially frozen). Prepare all other recipe ingredients before opening the phyllo package, and have waxed paper and a cool damp towel ready to cover it. Always work on a flat dry surface, and make sure your hands are dry. Getting the phyllo wet (with water) will make it gummy and sticky, and impossible to manage. Gently open and unfold phyllo. If any pieces stick together and cannot be gently separated, the usable part can be cut away, if large enough. Small breaks or cracks in phyllo sheets are normal. 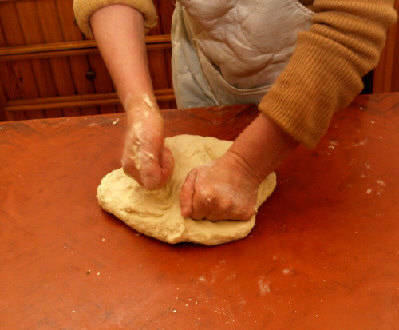 If a recipe calls for a certain size of cut dough, use a ruler. 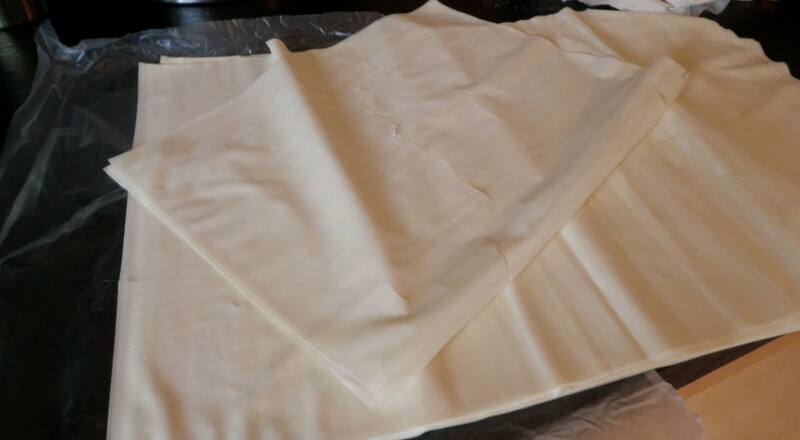 Phyllo sheets can be cut with a scissors, shears, pizza wheel, or pastry cutter. When brushing with butter or oil, or spraying with a butter-flavored cooking spray, start at the edges and work in. The edges dry out the fastest. And don’t use too much – just a light coating, otherwise the end result is greasy. If you have several pastry brushes, use a soft wider one (2 1/2 – 3 inches) for sheets, and a smaller one for small triangles or rolls. 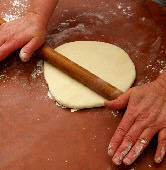 Otherwise, a soft 1 1/2 to 2 inch wide brush works well on both sheets and small pastries or pies. If the recipe for a pastry needs a perfect top layer and the dough has not cooperated totally so far, just select a perfect sheet, brush it carefully with butter or oil (per recipe directions), and use it as the outer layer or wrapping. When cutting phyllo pan pies into pieces before baking, make the first cut through the top layers of phyllo with a razor blade. It will cut through more cleanly, leaving nice edges. Follow up with a knife if the recipe calls for cutting all the way through to the bottom before baking. Phyllo pastries should always be cooked in pans with a flat bottom. Never try to reheat phyllo pastries or pies in the microwave. If they’ve been refrigerated, either serve cold (if appropriate) or let them come to room temperature. If phyllo sheets get torn or don’t defrost properly so they stick together at the edges, salvage what you can.